Our 1" heavyweight Polypropylene Webbing is available in black and white and provides versatility to many applications. Heavyweight Polypropylene Webbing provides higher tensile strength for heavy-duty projects and applications. Our 1" heavyweight Polypropylene Webbing is available in black and white and provides versatility to many applications. Heavyweight Polypropylene Webbing provides higher tensile strength for heavy-duty projects and webbing applications. We maintain extensive Polypropylene Webbing inventory to accommodate various requirements. We welcome the opportunity to provide custom webbing solutions for special design requirements. This may incorporate or combine the following products; snap fasteners, grommets & washers or metal fasteners with our webbing. 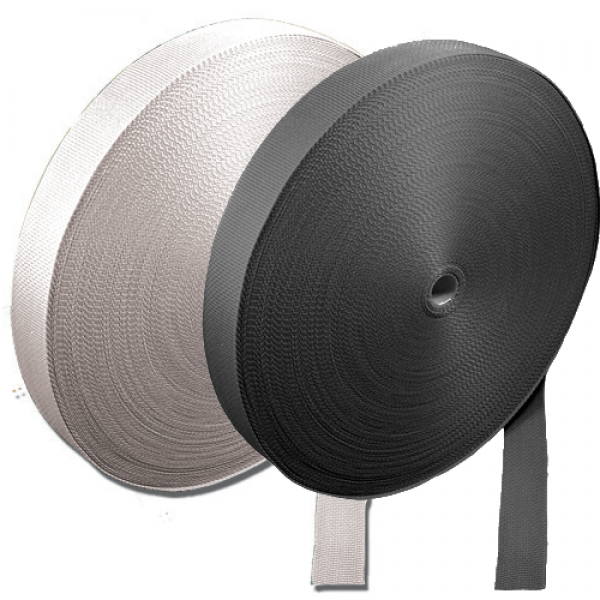 These Polypropylene Webbing product combinations provide a professional finished product. This service can reduce labor costs and ensure quality attachments.